Learn about the condition which is behind many mental and physical problems, which our children and adults suffer from, such as autism, hyperactivity and attention deficit, dyslexia, dyspraxia, depression, schizophrenia, bipolar disorder, obsessive-compulsive disorder, eating disorders and more. Watch this Amaaazing video! How a Mother healed her Son of Autism with GAPS! 1 whole chicken (“Mary’s Organic” or “Mary’s Natural Chicken” or as natural as possible). Ask the butcher to cut up the chicken into Walnut size pieces making sure to cut the bones to expose the marrow. Also, make sure to get back all the giblets – heart, liver, organs, etc. He/she will wrap this up in plastic bag and give it back to you. 3 tablespoons Apple Cider Vinegar (leaches out minerals). Or 1 tablespoon for each pound of chicken. 12 cups clean filtered (preferably distilled) water or enough to cover chicken. 1-2 tablespoon fresh organic whole black peppercorns, roughly crushed. (Optional: Fresh garlic to taste – peel and crush the cloves). 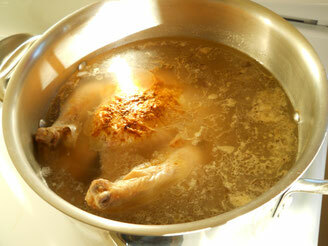 Place the cut up chicken with the giblets in a large pot with clean cold water and Apple Cider Vinegar. Let sit for one hour. Then add the ground Himalayan pink sea salt and fresh ground organic pepper, then turn on the heat. Bring to a boil. After about hour, remove the scum that has risen to the top, with a spoon or paper towel. Repeat this every so often as needed. Continue to simmer for 2 to 2.5 hours or until the chicken isn’t pink anymore. Remove the chicken & bones to a separate bowl, and strain the stock to remove small bones and peppercorns and put strained stock back into the cooking pot. Separate the chicken meat from the bones and set aside. Remove all the soft tissues from the bones as best as you can to a separate plate. Soft tissues is basically anything “soft” that could be blended, i.e., skin, ligaments, cartilage, etc. Also, cooking the gelatinous soft pieces for a longer cooking period will cause them to completely melt. Take care that you do not include any pieces of bone or hard pieces as you will cause the texture to become grainy which can be unpalatable. Then, if you would like, blend up these soft pieces and add them back to the soup – it will make it creamy looking. Or you can put them directly in the pot of broth on the stove and blend them with an immerseable blender. If you did not get the chicken cut up by the butcher now is the time to remove bone marrow from bones while they are warm, for chicken bones this would be accomplished by cracking open the chicken leg bones and thigh bones with pliers. If they are cooked long enough, they will simply snap in your fingers, or crumble. Put the broken chicken bones with the exposed marrow, back in the filtered broth, add a little vinegar, and cook a little while longer to leach out all the minerals and nutrients. Strain this broth with a fine sieve. Add the meat back in and warm up to a good soup temperature and enjoy! If you would like to add vegetables—when you are on full GAPS diet—do it in the last half hour of cooking. Cook them until they are very soft. Ask the butcher for the “Long Bone” of a cow and be sure to include the knuckles, joints and all the cartilage on either end. Then ask the butcher to cut it up into 2 inch slices to expose the marrow. “It is essential to use bones and joints, as they provide the healing substances.” – Dr. Natasha Campbell-McBride. For larger bones, you’ll have to cook them a long time, maybe 4-5 hours until you can tap them on a hard surface and the marrow falls out. 3 tablespoons Apple Cider Vinegar (leaches out minerals). Water to cover. Let sit for 1 hour. Cook the beef bones until you can take a large bone out of the broth and gently tap it on the counter and the marrow falls out. Make sure to not over cook the bones and broth. Discard the bones and strain the broth through a fine strainer. Then if you’d like to have some bulk in the broth, try these ideas: Fry up some very clean, grass fed hamburger with olive oil and Himalayan Sea Salt and fresh ground organic pepper and throw it into the broth! Or better, go get some very clean beef liver, heart, kidney’s, etc and cook it very slowly in a crock pot for 5-6 hours and add that to the broth with some allowed veggies and fresh garlic (or whatever good clean spices you like – remember no MSG or anything synthetic) and you will have a wonderful stew! Then, if you’d like to have FRESH broth available all the time, just “Can” the broth just like you “Can” any meats or veggies in a pressure cooker, etc. (not a hot water bath). The heat of the processing will seal the bottle – if you prepare the lids properly and it has to be a new lid, but the bands can be reused. 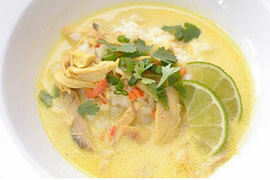 The only difference is you cannot put the broth away in your pantry – it has to be kept in the fridge or freezer! Keeps for 5+ months unopened. But when you open it, it will be as fresh as the day you made it! Yum, yum! 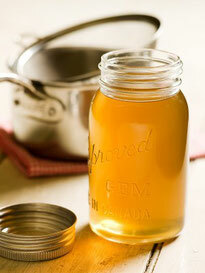 You will have fresh broth for soups, stews or as the base for many recipes and sauces! Fresh pressed garlic cloves, to taste. It’s so easy to make a pot of soup and get started on GAPS. The healing properties of broth are enormous and if you are interested in learning more please go here to read a white paper which will tell you all you ever wanted to know about broth: Traditional Bone Broth in Modern Health and Disease by Allison Siebecker (http://www.townsendletter.com/FebMarch2005/broth0205.htm). She defines what broth is, explains the basic method for making it, describes the nutritional content from the connective tissue, bones, bone marrow, cartilage, collagen, gelatin, and then explains the amino acid profile of broth, and she discusses the minerals and macrominerals in broth. 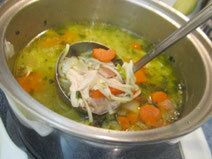 She also gives an extensive list of conditions which can benefit from adding broth into the diet. Quite a complex and informative read about broth which is highly recommended. Bring stock to a boil and add vegetables. Once again bring to a boil, and then lower heat until the soup is on a simmer. Cook for twenty to thirty minutes, testing the vegetables to make sure they are very soft, this makes them easier to digest. Add in the meats and other soft tissues (you may wish to blend the soft tissues with an immerseable blender first so as to make the soup more palatable). An easy way to make a nice creamy soup is to blend the vegetables, stock, and “soft bits” and then add in pieces of meat to the creamed soup. It’s so easy to make a pot of soup and get started on GAPS. The healing properties of broth are enormous and if you are interested in learning more please go here to read a white paper which will tell you all you ever wanted to know about broth: Traditional Bone Broth in Modern Health and Disease by Allison Siebecker (http://www.townsendletter.com/FebMarch2005/broth0205.htm). She defines what broth is, explains the basic method for making it, describes the nutritional content from the connective tissue, bones, bone marrow, cartilage, collagen, gelatin, and then explains the amino acid profile of broth, and she discusses the minerals and macrominerals in broth. She also gives an extensive list of conditions which can benefit from adding broth into the diet. Quite a complex and informative read about broth which is highly recommended. A cool thing you can do is freeze the broth in little ice cubes. Then take one or two out and warm them up in a ceramic cup or use them as the base in other cooking dishes. Traditional fermented foods like sauerkraut are usually bursting with beneficial lactic acid bacteria that boost digestive health. But because the FDA requires commercial sauerkraut to be pasteurized, which effectively destroys all the bacteria in it—including the beneficial bacteria—homemade sauerkraut is definitely a better choice to improve your digestive health. 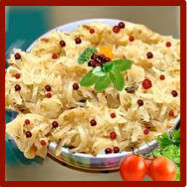 Sauerkraut is sought after not only for its flavor but also its amazing health benefits. Recent research says that sauerkraut when eaten by women during pregnancy can prevent babies from developing certain types of childhood cancer. Earlier studies have indicated that sauerkraut is effective in preventing cancer of the breast. Sauerkraut is fat and cholesterol free and is a great source of fiber as it contains plenty of vitamins C and K, manganese and vitamin B6 and folate. This helps in treating peptic ulcers as well. The fermentation process in sauerkraut produces good bacteria called probiotics, which in turn produces beneficial enzymes. They aid digestion and promote a healthy flora in the digestive tract. The following sauerkraut recipe is from Sally Fallon's book, Nourishing Traditions. It contains numerous recipes, including not only sauerkraut, but also pickled cucumbers, garlic, beets, radish, corn relish, potatoes, various chutneys, Korean kimchi, and more. In a bowl, mix cabbage with juniper berries, cumin, and mustard seeds. Mash or pound with a wooden pounder for several minutes to release juices. Place in a quart-sized wide-mouth Mason jar and pack down with the pounder. Mix water with salt and whey and pour into jar. Add more water if needed to bring liquid to top of cabbage. There should be about one inch of space between the top of the cabbage and the top of the jar. Place a lid on the jar and close very tightly. Lacto-fermentation is an anaerobic (without oxygen) process and the presence of oxygen, once fermentation has begun, will ruin the final product. Keep at room temperature for about three days, then transfer to a root cellar or the top shelf of your refrigerator. The sauerkraut can be eaten immediately but it improves with age. *If you use whey, it must be in the liquid form, not powdered. You can make your own whey by pouring yogurt into cheesecloth, a coffee filter, or a clean kitchen towel. Capture the whey liquid as it drips into another container. Using whey allows you to decrease the amount of salt needed and improve consistency. It is naturally rich in both lactic acid and lactic acid-producing bacteria. **Don't use tap water if it is chlorinated. The chlorine can destroy the lactic microbial organisms and prevent the fermentation. It's normal for white spots or a white film to form on the surface of the liquid covering the sauerkraut. It's a form of yeast called kahm. Although it's totally harmless, it can impart a bad taste to the cabbage so I would recommend simply removing it gently with a spoon before removing any of the sauerkraut. Tightly packed sauerkraut can be safely kept in the refrigerator for six months or more. The sharpness of sauerkraut depends upon how long it is cooked. To derive most tang and greatest crispness from sauerkraut, simply heat it. For milder flavor, cook it longer. Late cabbage is best for sauerkraut as it has higher sugar content. Ingredients: 1 pound fresh sauerkraut rinsed and well drained, 1 diced onion, 1 can stewed tomatoes, ½ cup dark brown sugar, 3 lbs pork ribs, celery seed to sprinkle. Layer all the above mentioned ingredients in a slow cooker beginning with sauerkraut. Cover and cook on low for eight to ten hours. Ingredients: chicken cutlets, 2 beaten eggs, 1 cup bread crumbs, 1 can of sauerkraut, 15 oz tomato sauce, oil to add, 1 ½ cup mozzarella cheese, ¼ cup grated parmesan cheese. Pound the chicken until thin and combine with herbs and bread crumbs. Dip chicken into eggs and then into breadcrumbs. Bake in 400 degree oven. Pour sauce on top of chicken and cover with sauerkraut. Sprinkle parmesan cheese and bake in 350 degree heat oven. Top with mozzarella and bake about five minutes. Ingredients: 1 can of sauerkraut, 1 cup diced tomatoes, 1 cup bread crumbs, 1 chopped onion, 4 medium orange roughy fillets, 4 teaspoons butter, 8 table spoon Mayonnaise, squares of foil. Place a fillet in the center of each foil and on top of fillet place 2 table spoon mayonnaise. On top of this place ¼ cups of onion, sauerkraut and tomatoes. Finish off with breadcrumbs and a pat of butter. Fold the corners of the foil and place the pouches on a cooking sheet. Cook for about ten minutes and then rotate. Continue to cook for another ten more minutes. Ingredients: drained and rinsed sauerkraut, 1 can condensed cream of celery soup, 1/3 cup of brown sugar, 1 ½ cup of sausage, 4 medium potatoes peeled and cubed, 1 cup chopped onion and 1 cup shredded mild cheddar or jack cheese. In crock-pot, combine the soup, sugar and sauerkraut. Stir in sausage, potato and onion. Cover and cook on low heat for about 8 hours. Skim off excess fat. Add shredded cheese on top. Ingredients: 2 pounds bratwurst, 1 quart sauerkraut, ½ cup brown sugar, ground pepper and hot mustard to taste. Preheat oven to 350 degrees. Layer sauerkraut in a baking dish and sprinkle evenly with brown sugar. Score the bratwurst and place on the sauerkraut. Bake for an hour. Serve with mashed potatoes and a dollop of hot mustard. Ingredients: 2 pounds fresh bratwurst, 2 table spoon oil, 2 onions chopped, 2 garlic cloves minced, 2 cups chicken, 1 tablespoon paprika, 1 table spoon caraway seed, 4 cups of drained sauerkraut, 2 tablespoons chopped fresh dill and 1 baguette. In a large pan, heat oil over high heat. Brown bratwurst in oil and reduce heat to medium. Add onions and garlic and cook light. Add stock, paprika, caraway seeds and sauerkraut and simmer for 45 minutes. Remove from heat and stir in fresh dill. Serve on baguette. 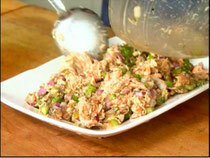 Drain the salmon and put the salmon in the food processor. Peel and then coarsely chop the onion, add that to the food processor, coarsely chop the cucumber (or celery) and add that. Put in ½ cup of the homemade mayo at left. Pulse the food processor a couple times to distribute the mayonnaise, onion, and cucumber (or celery) with the salmon. Maybe add some capers! Using a food processor, drop a whole raw egg in and whir it for a couple minutes to bring it up to room temperature. Then slowly pour in 1 cup of olive oil, taking an entire minute to pour it in, then add salt and allow to mix. Reserve half of the mayonnaise in another dish for later. 1-2 pounds beef, any cut. 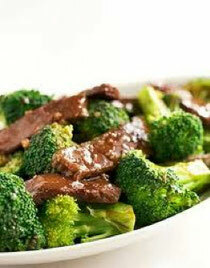 In a Crockpot, combine broth, filtered water to fill the crock pot ¾ full, salt, garlic, and broccoli. Cover, and allow to cook on low all day. An hour before you are ready to eat, cut beef into ½ inch cubes, and brown in a skillet over medium high heat until browned on the outside and partially cooked. Using an immersion blender, puree the soup, (maybe add some raw milk or heavy cream) leaving some chunks of broccoli and onion if desired. 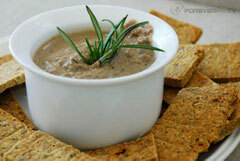 Add beef to pureed soup and allow to cook until dinner time. Ladle into bowls and generously top with cheese to serve. Fill a large pot half full of filtered water and bring to a boil. Add oil and sea salt; the oil makes the shells easier to peel off, the Celtic salt helps prevent the white from leaking should the eggs become cracked while boiling. Gently put whole raw eggs in the water, using a slotted spoon if needed to prevent them from cracking. 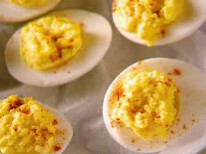 Boil eggs on medium-high heat for exactly 10 minutes. After 10 minutes pour off excess boiling water and add cold water to the eggs to cool. As the water heats, replace with cold water 2-3 times; every couple minutes. Store eggs in the fridge or peel immediately. Gently peel eggs under running water. Slice in half lengthwise. Pop yolks into a sandwich-sized zip top bag (or a bowl). Add remaining ingredients and smash with your fingers in the zip top bag (or smash with a fork in the bowl). Add more mayonnaise if necessary. Once thoroughly mixed, cut a corner off the bottom of the zip top bag, approximately 1/2 inch up from the top of the corner. Pipe the yolk mixture into the egg whites, or use a spoon to drop the mixture into the egg whites, and then garnish with paprika. Keep covered in the fridge if you have leftovers. Simmer all ingredients to make a soup. Puree with an immersion blender if desired for a smooth soup. Large butternut squash or other winter squash. Peel squash, cut off neck and cut neck into ‘squash fries’ – fry shapes. Scoop out pulp from bulb, and chop into chunks for adding to soup, boiling, and mashing. 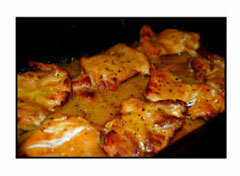 Gently heat chicken left from stock in a steamer or by boiling in water. Top with Butternut squash soup, or dip in the soup. Preheat oven to 350* Mix hamburger with sea salt, 1 tbsp fat, and Thyme and Sage. Peel and remove pulp from butternut squash, and chop into bite-sized pieces. Grease a 9x13” pan with fat. Place squash in the pan and pour stock over the squash. 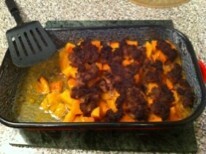 Place pieces of the raw hamburger over the top of the squash, covering evenly. Bake uncovered for 45 minutes or until squash is soft and beef is cooked. Mix hamburger with vegetables, garlic, and parsley. Simmer in stock with added sea salt, gently turning as needed, until cooked through. Soak nuts: Place 2-3 lbs raw nuts in a large bowl (they will swell, so only fill 2/3 full, using another bowl if needed). Add 2 tablespoons sea salt and cover the nuts with filtered water. Allow to soak overnight at room temperature (on the counter). No need to cover. Drain in a colander and put in dehydrator; dehydrate all day. Or roast in a pan as low as your oven will go, 1 hr. In a blender, blend squash, walnuts, and eggs until smooth. Heat a skillet on medium-low heat and melt tallow. 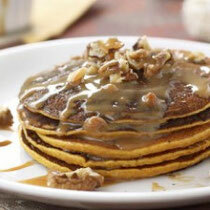 Make small pancakes with the batter, and carefully flip only once, after 90 seconds or so. 1 inch ginger root, peeled and sliced into thin coins. Simmer in 2 quarts water for about 10 minutes, covered. Or grate about a teaspoon of fresh ginger root and poor boiling water over it and leave for 3-5 minutes. Pour through a small sieve. And add honey to taste and enjoy warm or cool. To easily peel ginger, use a spoon to rub off the skin. Aside from the ginger and carrots, which you might want to grate smaller, thinly slice all the vegetables and mix with the salt. Place into jars, pounding down to release juice. Add whey over the top, cover with a lid, and set in a room temperature place to ferment for 2-3 days without opening. Transfer to fridge after that and enjoy now or later. Left unopened, it will last months in the fridge, but once you open them and use within a couple weeks. This baked salmon is slow-baked right on the serving platter- no mess, no fuss! Mix dill, thyme, pepper, and sea salt. Grease an oven proof serving platter with olive oil. Place salmon filets on there, and drizzle with olive oil. Sprinkle with herbs. Bake for about 40 to 45 minutes, until salmon flakes. ¼ cup loosely packed basil, or 1 Tbsp. fresh thyme, minced. Grate summer squash on a box grater and add to a colander. Add 1 Tblsp tallow to the shredded squash and toss to combine. Let squash sit and drain in the sink for 30 minutes. In an oven-proof skillet (cast iron worked extremely well), heat 2 Tblsp tallow over medium heat. Add onion, garlic and paprika to the skillet and stir. Sauté until tender and fragrant. Squeeze the squash by the handful to remove excess moisture and add to the onion and garlic. Add the chopped tomato and stir to combine. Cook, stirring occasionally, until the mixture is tender and no longer releasing liquid. This takes about 8-10 minutes. Turn the heat off and stir in the goat cheese and basil (or thyme). 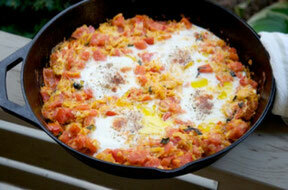 Using a wooden spoon or spatula, smooth the mixture evenly in the skillet and create 4 wells for the eggs. In each well, add ½ teaspoon tallow oil. Crack each egg into a small bowl and add one at a time to each well. Sprinkle each egg with salt, pepper. Bake until egg whites are set and yolks are still soft, about 8-10 minutes. Garnish with extra basil (or thyme). *If you don’t care to turn on the oven, poach the eggs directly in the skillet. After stirring in the goat cheese and herbs in step 5, return skillet to the low-heat, add the eggs to the wells and cover with a tight-fitting lid for 10 minutes. Over high heat in a large saucepan, heat tallow until melted then add onions, stir, cooking for about 5 minutes, or until softened, add garlic and thyme, cook for a minute or two more. Remove from heat, drain excess liquid, and pour this into food processor. Using the remaining two tablespoons of butter, melt over medium heat. Add liver and cook until the outside is done, but the inside is still pink. Drain. Process until well pureed and all of the ingredients are well combined. Form pates by lining 3 custard dishes or small ramekins with plastic wrap. Spread in pate, and place two in the freezer for later, one in the fridge. Turn out, and remove plastic wrap to serve. Stir into soups, or use on top of nut flour bread. In the bottom of a pot, sauté onions, ginger, and pepper in tallow until onions are soft. Add stock and water and bring to a simmer. Add chicken and cook 20 minutes, or until heated through. Top with garlic, decorate it as in the picture above and serve. 4 cups of chopped vegetables (broccoli, carrots, onions, spinach, tomatoes, squash; whatever combination you'd like). 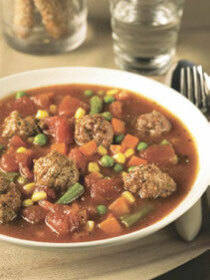 Add stock, water, salt, tomato paste, vegetables to crock pot and cook on low all day. 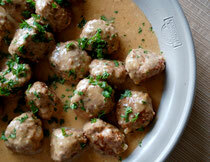 Add meatballs during the last 30 minutes of cooking to heat thoroughly. When serving, evenly distribute meatballs among bowls with the soup. Mix everything with a fork, or by hand. Shape into walnut sized balls and fry in a skillet with the fat over medium heat, gently turning the meatballs during cooking to make sure all sides get cooked. Fry until browned on the outside, cutting one open to make sure they are no longer pink on the inside. Puree all ingredients in a blender or food processor (you can keep the zucchini raw and just puree). 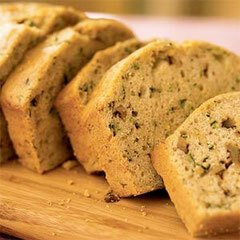 Pour into greased muffin tins or a small loaf pan. Bake at 350* for 30-45 minutes, or until a knife inserted comes out clean. If the person is not prone to diarrhea, they may introduce the GAPS milkshake from the beginning. Eggs: 1-2 raw eggs (yolks and whites) preferably use organic free range eggs. Fats: 4-5 tablespoons of raw sour cream or yogurt (if sour cream has not yet been introduced, you may add ghee or raw butter (at room temperature – softened) or raw coconut oil. Freshly press all vegetable items in your juicer and pour into the blender if you have one. To the juice add the eggs and fats. Blend the mixture together in the blender or mix by a hand held kitchen tool. This milkshake will provide valuable raw nutrients and beneficial fats. Some parents find it easier to add Cod Liver Oil to the milkshake, rather than on its own and children don’t know it has been added. Dr Natasha suggests starting from 1/3 of a glass per day first thing in the morning. For optimal benefits, Dr Natasha encourages 4-5 glasses of the GAPS Milkshake per day, in-between meals and to chew every mouthful slowly. 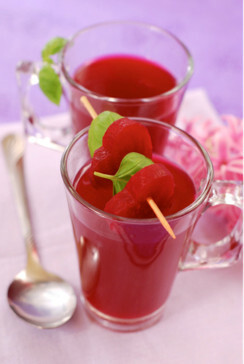 Beet Kvass is a wonderful digestive aid. It assists in correcting constipation whilst promoting regularity and adds to the body a variety of nutrients and cleansing qualities. Beet Kvass has great liver supporting properties that assist in reducing morning sickness in pregnant women. Fermented foods are essential to introduce to the GAPS diet from the beginning and kefir can be managed after whey and yogurt have been successfully introduced. 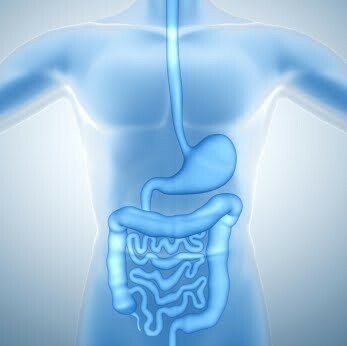 Supplementing with probiotics alone will allow beneficial flora to do its job primarily in the upper parts of the digestive system, which does not generally reach all the way down to the lower bowel however, fermented dairy will carry probiotic microbes all the way down to the end of the digestive system. Whilst yogurt carries some very beneficial forms of beneficial flora, Kefir has been known to carry colonies as large as 27 different strains or more. Fermentation predigests the dairy, making it easy for our digestive systems to handle, that is why fermented foods are easily digested by people with damaged gut. 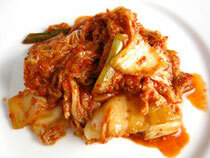 Fermentation releases nutrients from the food, making them more bio-available for the body. You can get a commercial Kefir starter in a sachet or use some live fresh kefir grains as a starter. If you make kefir from organic unpasteurized (raw) milk, then do not heat it, just add the starter and ferment it on the bench. Only pasteurized milk needs heating, as pasteurization makes milk vulnerable to contamination by pathogenic microbes. Raw milk is usually well protected by its own probiotic bacteria and other factors. Making kefir with pasteurized milk, is a bit of an exact science with heating the milk properly, adding just the right amount of starter culture, blending it in, trying(!) to keep it at the right temperature for 12 hours or so. The results are usually less than satisfying: the flavor is there, but the texture will always be too liquid, and if left any longer then you’ll have cheese at the bottom and whey on top. With raw milk from a pasture fed cow (read: healthy cow with healthy stomach flora = healthy milk with lots of probiotics) kefir making is as simple as setting the fresh milk on the counter. No joke. Also, I warm the milk before adding the culture. You should mostly use raw milk, so you only warm it to about 100 degrees so the enzymes are still intact. If you use pasteurized, it’s best to bring it to a boil to kill any bacteria, which has contaminated it since pasteurization, and then cool it to 100 degrees before adding the culture. This factor (raw milk protecting itself with the live immune cells in the milk) is the factor which anti-raw warnings often overlook. Pasteurized milk is actually much more risky, since there is no internal protection after it’s been “killed”. Hundreds of Americans are poisoned by pasteurized milk each year, and it is very rare to hear of an incident from raw milk. Remember, that kefir contains more potent probiotic microbes than yogurt, as a result kefir will produce a more pronounced “die-off reaction.” It is recommended to introduce yogurt first, then start introducing kefir. Both should be introduced slowly and gradually controlling the “die-off.” Kefir, apart from probiotic bacteria, contains beneficial yeasts. That is why it is essential to introduce for people with “bad” yeast overgrowth. A healthy human gut contains plenty of beneficial yeasts, as well as beneficial bacteria and other microbes. In order to get rid of the “bad” yeast, we need to replace it with the “good” yeast. 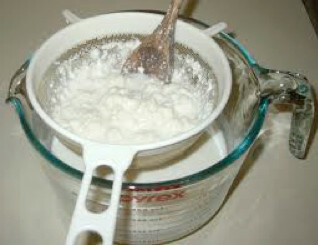 By dripping your kefir through cheesecloth you can separate it into cottage cheese and whey. Pour the whey into a clean glass jar with a tight lid and keep it in the refrigerator to use as a starter for fermenting different foods, such as vegetables, fish, beans and grains (when your you are ready to have them). The cottage cheese is delicious with some honey, fruit, soups or as a savory snack. Add 2-3 tablespoons kefir grains to milk. Set open jars, covered completely with a clean paper towel or cheese cloth, on counter in an out-of-the-way area, protected from drafts is best. Make sure your house is warm enough that the counter isn’t cold. They don’t need to be in the kitchen, but should not be in an area where they could absorb fumes, such as a laundry room (detergent fumes) or garage (gasoline, etc.). Wait 24-48 hours. You can check the culture and stir it during this time: this may be beneficial for the kefir to move the grains around. As a rule, less time will produce a sweeter, thinner kefir, whereas a longer fermentation will result in a thicker, more sour kefir. After some time you may also see the kefir separating into two layers – a thick, white curd at the top, with a thin, yellowy whey underneath. The kefir is OK to consume at this stage but will be quite sour, so as soon as you see any signs of separation it’s probably best to move on to straining the kefir. When it is finished, straining will be necessary to remove the grains. 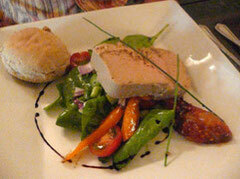 This can be done by putting a sieve over a glass pouring container as the picture shows. Gently push the grains with a spoon to strain out all the kefir. You can then plop the grains into more fresh milt to prepare the next batch, or put them back in a capped glass bottle and store in the refrigerator. Rinsing the grains is not necessary. But if you really want to, you can “fast” the grains by placing them in filtered water for one day [one part kefir grains to 3 part water as a general rule]. The grains are then strained and placed directly in fresh milk to prepare kefir as per usual. A deliciously fruity kefir smoothie, perfect for a quick breakfast or snack! Stevia or other sweetener, optional. For more protein, you can also add in a scoop of Whey Protein Complex powder. 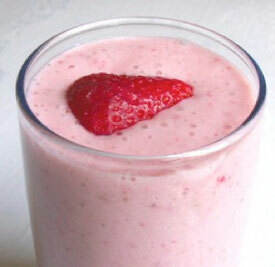 Instructions: Place banana, strawberries, kefir, and Stevia (if using) into a blender. Blend for a minute or two, until smooth. Pour into a large glass or two smaller glasses and enjoy! 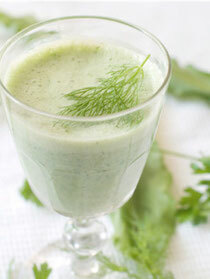 This is a favorite, quick-and-easy kefir smoothie. Always have strawberries and bananas on hand (or at least, almost always!) and the flavors combine for a lovely fruity and healthy kefir smoothie! Your children will love this recipe, and you will too!